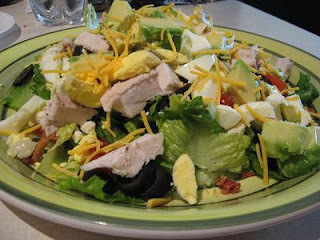 What we had for dinner tonight...my all-time favorite salad. No real "measurements," but be sure to use plenty of the following ingredients! blue cheese dressing or other favorite dressing of your choice!! Perfect salad to go along with your end-of-summer picnics and BBQs with friends. Try it. Cook pasta according to package directions. When pasta reaches al dente, drain and rinse with cold water until cool to the touch. Drain well. Return pasta to a large bowl and mix in the remaining ingredients and toss well. Chill until ready to serve.